This theorem about Ramsey numbers, sometimes called the friends and strangers theorem, is fun because it is accessible, no matter your math background, but leads very quickly into open questions in math. The minimum number of people you need to guarantee a trio of friends or a trio of strangers is called the Ramsey number R(3,3), and proving that it is six is doable with pencil and paper. The equivalent question for four mutual friends or strangers—finding the Ramsey number R(4,4), logically enough—is much more difficult but was solved in the 1950s. For five friends or strangers, the Ramsey number R(5,5) is unknown. If you’d like to learn more about Ramsey numbers and how little we know about them, check out these posts. In each episode, we ask our guest to pair their theorem with something: food, beverage, art, music, or other delight in life. Dr. Duong chose broccoli with cheese sauce. You’ll have to listen to the episode to find out why it is the perfect accompaniment to the friends and strangers theorem. 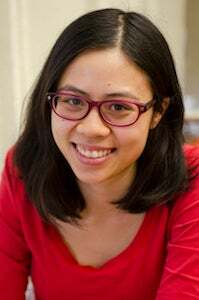 You can find Dr. Duong on her website, her blog Baking and Math, and Twitter. Some of her writing on science and health appears at North Carolina Health News. As we mention in the episode, both she and I started our science writing careers through the AAAS Mass Media Fellowship program. This paid internship places math and science graduate students or recent graduates in news rooms around the country for a summer. Our fellowships were sponsored by the American Mathematical Society. Both of us consider it formative in the direction our careers have taken. You can read about her experience with the Mass Media Fellowship in the Notices of the American Mathematical Society here. If you are a math or science graduate student and think you might be interested in writing about math and science for a general audience, you can learn more about the fellowship and find a link to the application here. Applications are open until January 15, 2019.